CRANSTON, R.I. (AP) – The second major rainstorm of the month pounded the Northeast on Tuesday, pushing rivers over their banks, closing roads and schools, prompting evacuations, and shattering at least one rainfall record. Rhode Island Gov. Don Carcieri asked residents Tuesday afternoon to get home by dinnertime to avoid traveling in what officials expect to be the worst flooding to hit the state in more than 100 years. "The worst is still ahead of us," he said during a broadcast carried live on the state's major TV stations. "We're in a serious, serious situation." 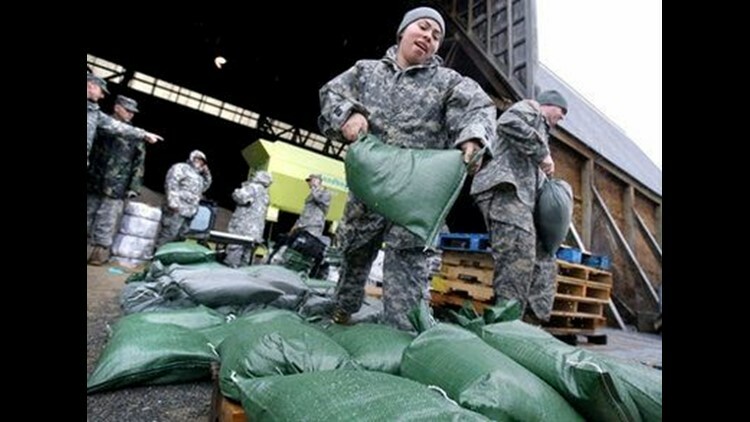 National Guard troops were activated in Massachusetts and Rhode Island, where neighborhoods still recovering from earlier flooding were again swamped after two days of unrelenting rain. Troops in Connecticut were put on alert. A storm two weeks ago dropped as much as much as 10 inches of rain on the same region. The National Weather Service said nearly 13 inches of rain had fallen during March in Boston, breaking the previous record of 11 inches for the month set in 1953. New York City could also break its March record. Providence had about 7.2 inches of rain from the current storm as of 10 a.m., pushing the monthly rainfall total to 14.7 inches and within an inch of the city's all-time monthly record, set in October 2005, the weather service said. Scattered home evacuations were reported in Rhode Island, Connecticut and Massachusetts. No injuries had been reported in those states because of the storm as of midday Tuesday. In one water-weary neighborhood along the Pawtuxet River in Cranston, basements were flooded and water at the end of one street was waist deep. One resident hung a sign: "FEMA + State + City of Cranston. Buy our houses." Brian Dupont, a real estate broker who owns two homes on the street, said Tuesday morning that he worried the water would rise to the first floors. "Right now it's bad and getting worse," said Dupont, who with his son put down 30 sandbags around the properties but was not sure how effective they would be. "We've got a saying, 'Its like trying to shovel against the tide.' It's terrible, terrible," said Dupont, who was afraid the home might now be unsellable. Standing water pooled on or rushed across roads in the region, making driving treacherous and forcing closures. Steve Kass, spokesman for the Rhode Island Emergency Management Agency, said officials feared Interstate 95, a major East Coast thoroughfare, could end up under water in some sections. In Maine, a dam in Porter let loose Tuesday morning, sending a torrent of water down country roads. One road ended up covered with 2 feet of water, but no evacuations or injuries were reported. North of New York City, a man in his 70s drove past a barricade onto a flooded section of the Bronx River Parkway and had to be rescued from the roof of his truck, Westchester County police said. On Long Island, rain coupled with tides inundated a 20-mile stretch of oceanfront road in Southampton. Water Row, a scenic road running along the Sudbury River in Wayland, Mass., lived up to its name Tuesday as water from the swollen river covered the street. Bob Irving, the town's police chief and emergency management director, said Water Row and two other low-lying streets along the river had been closed, but no mandatory evacuations had been ordered yet. During the three-day storm earlier in the month, amphibious Duck Boats like the ones used to ferry tourists around downtown Boston were deployed to take stranded residents to and from their homes. The boats could be used again if conditions deteriorate, Irving said. In Connecticut, Norwich officials declared a state of emergency as the Yantic River continued to rise. Officials in Stonington ordered an evacuation of some areas as a precaution against rising flood waters. Weather-related delays averaged three hours at Newark Liberty International Airport, and two hours at New York's La Guardia Airport, according to the Port Authority of New York and New Jersey. In New York City, a mudslide caused some interruptions on a commuter rail line in the Bronx. The rain also caused a run on basement sump pumps at hardware and home improvement stores. Jim Tatarczuk, manager of Amesbury Industrial Supply Co. Inc., told The Daily News of Newburyport, Mass., his store would normally stock about 130 pumps for the spring, but he has sold nearly double that already. "There are people who are still pumping out from the old storm, and now we have more on its way," he said. President Barack Obama issued disaster declarations for many areas of New England to free up federal aid to residents and households for damages caused by late winter and early spring storms. Assistance can include grants for temporary housing and home repairs, and low-cost loans to cover uninsured property losses. Associated Press writers Bob Salsberg in Wayland, Mass., and Stephen Singer in Hartford, Conn., contributed to this report.